Maria Breeze: Mise à jour et rafraîchie 5 Chambre - Great Location-Vues. Maria Breeze est une belle villa de location de cinq chambres et cinq salles de bain située à John, Îles Vierges américaines. Maria Breeze se compose de trois bâtiments distincts reliés par des ponts et des escaliers couverts. Cette grande maison de l'échelle est parfaitement positionné sur Saint- John pour profiter des services de l'île et le parc national. Villa Maria Breeze est idéal pour les familles et les groupes qui voyagent ensemble. La grande maison de maçonnerie repose sur une colline, où les brises fraîches se déplacent à travers les grandes fenêtres des deux nichons et dans la maison principale. Tous les cinq chambres sont climatisées, chacune avec une société privée fans de bain et plafond. Internet sans fil disponible. La piscine de 10 X 20 pieds et le pont se trouve à quelques pas des suites d'une chambre inférieure, et a une vue imprenable sur 230º St. Thomas et Saint- Rive-Sud de John. La maison entière est entouré par un paysage tropical. Tout type de sports nautiques de la plongée au para-voile est disponible. Visites d'autres îles sont une excursion d'une journée facile loin. Location de bateaux - jet skis, bateaux à moteur, des kayaks, des voiliers et voiles de jour sont tous à quelques minutes. Ou, bien sûr, vous pouvez vous asseoir près de la piscine privée, profiter meilleur climat de la planète et ne rien faire. Mark Shekleton - Seaview Homes Inc.
Maria Breeze and Mark Shekleton are the Best! We have been coming to St. John since 1995 and have stayed at many different villas with many different villa management companies, including Seaview Homes. But after this year, I think Maria Breeze and Mark are our favorites. I had been looking at Maria Breeze and when I read that the villa had been updated, I booked it. All of the bedrooms and baths have been refreshed and the exterior decks and fencing has been updated. But the best thing about the villa is its location, views, and never ending breezes. My husband and I stayed for almost 3 weeks, the first half with another couple who we travel with and the last 10 nights with my daughter, her husband, and their two adorable kids, 5 and 2. The home is perfect for couples and families and we really can't wait to come back! I can't end this review with a shout out to Mark Shekleton. He is a rock star when it comes to villa management and the very few issues that we had were solved instantly with no muss, no fuss. Mark, you were tops! Thank you for the great review! Much appreciated ! Absolutely fantastic spot with best views on the island! Property manager was incredibly helpful and overall I'd gladly recommend to anyone! Where to even start with this review.... My fiance and I found Villa Maria Breeze after a 3 month long search for a place to stay for the week of our wedding. We had 3 other couples, Us and 1 other person stay for the week. The views of this Villa are out of this world, not to mention the beautiful breezes you get all day long. Even at night your surroundings are breathtaking, you can see all of St.John and St.Thomas lit up like nothing you can imagine. The set up of the home is absolutely brilliant each bedroom has a well working AC unit. Sooo spacious, each room has a private bathroom and they're all very well layed out and cozy. The main living area is actually disconnected from the bedrooms (except for the 2 that are underneath, yet you have to walk outside down steps to get to them). The balcony was a forever hang out spot, not to mention dipping in the pool which was also takin advantage of the entire stay. You will not be disappointed with this Villa. Everything was absolutely spectacular... If you're looking for perfection, look no further. Villa Maria Breeze aka Perfection. A paradise on it's own. Sunny breezes with a killer view! 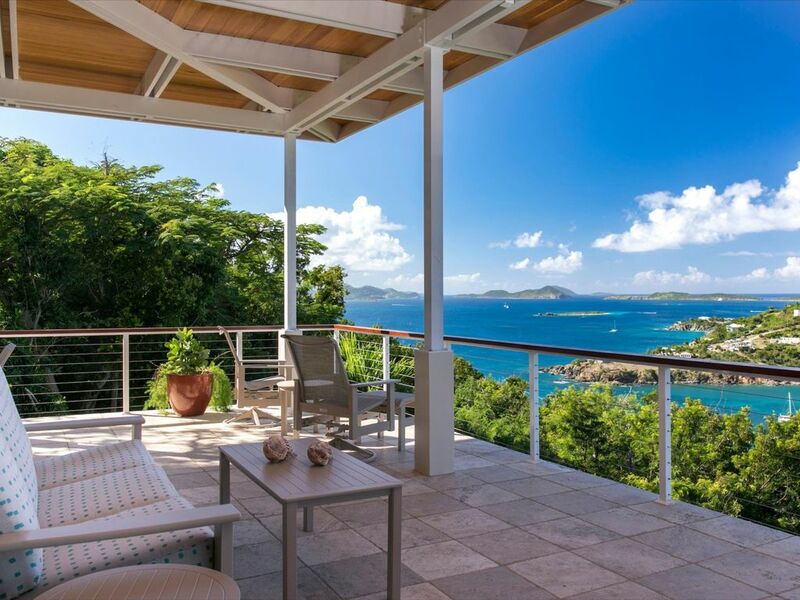 Maria Breeze was the absolute most perfect villa for my group's summer escape to St. John. With 5 wonderful bedrooms, each couple had their own private bath and everyone was comfortable. The main unit's fabulous veranda was our hangout spot from breakfast til sunset and on into the evenings. I never even watched TV the entire time we were there and never missed it. To us, the show was outside, and we didn't want to miss a minute of it. The trade winds were fabulous and the pool was awesome! We didn't want to leave and can't wait to go back! Everyone wants to stay 10 days instead of a week next trip ~ yay! Special shout out to Mark for checking on us and making sure that we had everything that we needed. You rocked it, and we totally appreciated your assistance! Our family of 9 gathered here from 4 different states ages 22-80. Everyone was absolutely thrilled with the property. We enjoyed how it provided 7 or more seating areas for people to spread out to sit and visit or just be alone to read/work on computer. We've visited St John a dozen times and we must say this property is exceptional. The views are truly beautiful both day and night. We've learned that "catching the trade winds" is very important and this property perfectly provides that. Great proximity to town. Beautiful street to take a walk on. A/C in "bedrooms only" was just fine. Room set up couldn't have been better! Comfy beds and updated bathrooms are very nice. The men admired the new decking and grill - ha! Great customer service from Mark Shekleton with Seaview Homes and Marsha even helped us with reserving our 2 Jeeps. If we ever get a chance to pull 9 of us together again we will definitely choose to stay at Maria Breeze. We were a group of 10 couples and the house was perfect for our week vacation. Tons of excellent outdoor space to relax on, do yoga on and eat on. Great dining and living room too. Pool and grounds all very well maintained and working AC in all rooms. And an ice maker! It was a perfect house for us - we would definitely come back. Villa Maria Breeze situé dans le quartier exclusif de Maria Bluff de Saint- John 400 pieds d'altitude avec l'océan panoramique à 180 degrés et Mtn. et alizés. La villa est à 6 minutes en voiture de Cruz Bay avec de nombreux restaurants et magasins. Supermarché le plus proche se trouve à 5 minutes en voiture. Les plages du parc national sur la côte nord sont à 12 minutes en voiture.